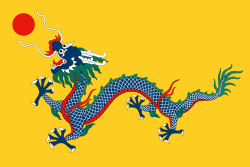 "Anthem of the Beiyang Fleet"
The Beiyang Fleet (Pei-yang Fleet; simplified Chinese: 北洋舰队; traditional Chinese: 北洋艦隊; pinyin: Běiyáng Jiànduì; Wade–Giles: Pei3-yang2 Chien4-tui4; literally: 'Northern Ocean Fleet', alternatively Northern Seas Fleet) was one of the four modernized Chinese navies in the late Qing dynasty. Among the four, the Beiyang Fleet was particularly sponsored by Li Hongzhang, one of the most trusted vassals of Empress Dowager Cixi and the principal patron of the "self-strengthening movement" in northern China in his capacity as the Viceroy of Zhili and the Minister of Beiyang Commerce (北洋通商大臣). Due to Li's influence in the imperial court, the Beiyang Fleet garnered much greater resources than the other Chinese fleets and soon became the dominant navy in Asia before the onset of First Sino-Japanese War in 1894–1895 — it was the largest fleet in Asia and the 8th in the world during the late 1880s in terms of tonnage. Admiral Ding Ruchang (1836–95), the Beiyang Fleet commander. Ding was a cavalryman by background. The creation of the Beiyang Fleet dated back to 1871, when four ships from the southern provinces were shifted north to patrol the northern waters. The Beiyang fleet was initially considered to be the weakest of the four Chinese regional navies. This soon changed when Li Hongzhang allotted the majority of naval funds to the Beiyang Fleet. In 1884, on the eve of the Sino-French War, the Beiyang Fleet was the second-largest regional navy but was gradually closing the gap with the Nanyang Fleet, based at Shanghai. By 1890, it was the largest of China's four regional navies. Unlike the other Chinese fleets, the Beiyang Fleet consisted mostly of battleships imported from Germany and Britain. When the flagships Dingyuan and Zhenyuan were purchased from Germany, the superiority in strength of the Beiyang Fleet became evident, as Germany was the emerging world power, rivalling Britain (which dominated the ocean) in new naval construction. The Qing Chinese navy at its peak consisted of 78 ships, with a total tonnage of 83,900 tons. However, construction of new ships almost completely stopped in 1888 due to high expenditures in other fields by the Qing dynasty. Grand Tutor Weng Tonghe, advised the Guangxu Emperor to cut all funding to the navy and army, because he did not see Japan as a true threat, and there were several natural disasters during the early 1890s which the emperor thought to be more pressing to expend funds on. Due to missing expenditures, the training of the fleet and personnel essentially ran to a standstill, which eventually contributed to its defeat in the Battle of the Yalu River against Japan. The British naval officer Captain William Lang was recruited by Hart and Li Hongzhi in 1882 to advise the Chinese in naval matters. The Beiyang Fleet took good care to stay out of range of Admiral Amédée Courbet's Far East Squadron during the Sino-French War (August 1884 – April 1885). Nevertheless, it featured prominently in the calculations of the French government between 1883 and 1885. The Beiyang Fleet was due to take delivery in early 1884 of Dingyuan, Jiyuan and Zhenyuan, three modern warships then building in German shipyards. In December 1883, as war with China seemed increasingly likely, the French persuaded the German government to delay the release of these three ships. They did not reach China until the autumn of 1885, after the end of the Sino-French War. In late June 1884, when the news of the Bắc Lệ ambush broke, the French admiral Sébastien Lespès, commander of the Far East naval division, was cruising off Che-foo in the Gulf of Petchili with the French warships La Galissonnière, Triomphante, Volta and Lutin, while the Beiyang Fleet lay at anchor in Che-foo harbour. Although war was clearly imminent, France and China remained technically at peace, and Lespès was forbidden to attack the Beiyang Fleet pending the outcome of diplomatic efforts to resolve the crisis. On 3 July 1884 the Beiyang Fleet's commander, Admiral Ding Ruchang (丁汝昌), withdrew his ships from Che-foo to Pei-ho, where a strong bar across the harbour protected them from the French ships. The fleet remained at Pei-ho in almost complete idleness throughout the Sino-French War. In February 1885 the Beiyang Fleet reluctantly released two of its ships, Chaoyong and Yangwei, to join a sortie launched by a number of ships of the Nanyang Fleet to break the French blockade of Formosa. The two ships set sail for Shanghai to join the Nanyang vessels, but were almost immediately recalled by Li Hongzhang, who claimed that they were needed to watch the Japanese in Korea. The result was the loss of two Chinese warships from the Nanyang Fleet at the Battle of Shipu (14 February 1885). Li's selfish attitude was neither forgotten nor forgiven, and in the First Sino-Japanese War the Nanyang Fleet made little attempt to help the Beiyang Fleet. In 1894, on the eve of the war with Japan, the Beiyang Fleet was in theory the most powerful fleet in Asia. It was only one of China's four regional fleets, but in numbers it equalled Japan's entire fleet. The pride of the Beiyang Fleet were the German-built steel turret battleships Dingyuan 定遠 and Zhenyuan 鎮遠. Between 1881 and 1889 the Beiyang Fleet acquired a squadron of eight protected or armoured cruisers, most of which were built in either Britain or Germany. The cruisers Chaoyong 超勇 and Yangwei 揚威, which joined the fleet in 1881 and were prudently kept far from the scene of action during the Sino-French War by Li Hongzhang, were products of Laird's yard, Birkenhead. Three German-built cruisers, Jiyuan, Jingyuan (normally romanised as Kingyuan or King Yuen 經遠 to distinguish her from another, British-built, cruiser whose name was pronounced identically) and Laiyuan 來遠, were completed in 1887 in the Vulcan yard at Stettin. Another pair of protected cruisers, Chingyuan 靖遠 and Zhiyuan 致遠, were built by Armstrong Whitworth in 1887 at its new Elswick yard. The latter pair were a class loosely known as the "Elswick Cruisers", ships built for export under a generally similar design. These cruisers were fast (25 knots) and heavily armed, but were not adopted by the Royal Navy because the Admiralty considered them to be "weak in structure". Their view proved to be right when both Chinese ships were lost in the Sino-Japanese War, and the Japanese (Yoshino and Takasago) during the 1904 Russo-Japanese War. These foreign-built ships were joined in 1889 by the armoured cruiser Pingyuan, a product of the Foochow Navy Yard originally named Longwei (Lung-wei, 龍威). The Beiyang Fleet also included six steel but unarmoured British-built gunboats, delivered in 1879. These gunboats, of identical specifications, were named respectively Zhenbei ("Guard the north"), Zhendong ("Guard the east"), Zhennan ("Guard the south"), Zhenxi ("Guard the west"), Zhenbian ("Guard the frontier") and Zhenzhong ("Guard the interior"). The first four ships were originally to have been allocated to the Nanyang Fleet, but Li Hongzhang was so impressed with their quality that he took them over for the Beiyang Fleet, compensating the Nanyang Fleet with four elderly gunboats that had served with the Beiyang Fleet since 1876. The Beiyang Fleet also possessed an array of small torpedo boats. Exact numbers are uncertain, because these craft were not systematically listed, but some details are known. Four 16-ton torpedo boats were built in 1883 at the Vulcan yard in Stettin for the use of the steel battleships Dingyuan and Zhenyuan. These four craft, known respectively as Dingyuan No. 1 and No. 2 and Zhenyuan No. 1 and No. 2, were delayed in harbour by the Germans during the Sino-French War along with their mother ships, and joined the Beiyang Fleet in October 1885. Claiming her responsibilities on Choson affairs, in 1894, the Imperial Japanese Navy launched the First Sino-Japanese War against China. Due to the lack of government funding and the intensive Japanese naval program, Beiyang's once superior resources were becoming outdated. By the time of the Battle of Yalu River (1894), the Beiyang Fleet suffered heavy losses due to the surprise attack of the Japanese and the inferiority of its equipment, and was eventually annihilated in the Battle of Weihaiwei. Minor attempts to rebuild the fleet were made after the war, but the Beiyang Navy was never to reattain its former significance. From 1896 to 1899 the fleet received new ships from Germany and the United Kingdom, including the Hai Qi-class cruisers Hai Qi and Hai Tien that arrived in Dagū, where they became part of the reorganized Beiyang Fleet at the time of the Boxer Rebellion. In 1909 the Beiyang and Nanyang fleets were merged and re-organised into the Sea Fleet and the River Fleet. ^ Chang, Jung (2013). The Concubine Who Launched Modern China: Empress Dowager Cixi. New York: Anchor Books. pp. 182–184. ISBN 9780307456700. ^ John King Fairbank (1978). The Cambridge History of China: Late Chʻing, 1800-1911, pt. 2. Cambridge University Press. pp. 250–. ISBN 978-0-521-22029-3. ^ Gardiner, Robert (1979). Conway's All the World's Fighting Ships 1860-1905 (First American ed.). New York: Mayflower Books. p. 397. ISBN 0831703024.